Final Draft has announced the release of Final Draft 8 for Mac OS X and Windows. The full version costs $249; upgrades are $79. 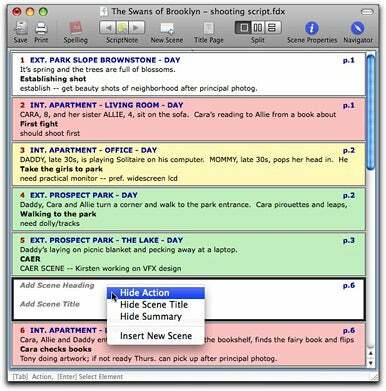 Final Draft 8's new Scene View helps you outline your script ideas and reorder scenes. One of the industry-standard tools for writing scripts on the computer, Final Draft is suitable for writing movie scripts, television series and stage plays. It sports word processing and professional script formatting tools. New in version 8 is the Scene Navigator, that helps you manage and view important details in a scene using a sortable floating palette. The Scene Properties Inspector lets you add scene titles and colors to track your story lines and characters. Page Count Management, a high-level Scene View overview mode, the ability to remember the workspace, and support for Extensible Markup Language (XML) as a file format has also been added. What’s more, many existing features have been improved, such as index cards and templates, the Panels system used to keep your script in sync with index cards and Scene View, improved spell-checking and thesaurus, revisions and page locking, printing and more. System requirements call for Mac OS X 10.4.11 or later, 256MB RAM, 50MB hard disk space.